It’s been too long since I posted any new images, and I feel it’s time. Some of you might know I spent most of October in Japan on Honshu Island. I visited the major cities of Tokyo, Osaka and Kyoto, but also really enjoyed the smaller cities and back country travelling on local buses and narrow gauge railways. Takayama, Miyajima, Shinagawa-Go and Kanazawa come to mind. It was the generosity and friendliness of the people that really made the trip a memorable one. Even though I don’t read or speak Japanese, complete strangers helped me in train stations, on buses and even on the streets. Most everyone speaks some English. We even met strangers who invited us into their homes–a special experience in a country like Japan. Yes, I took lots of photos, many at night. I travelled with two cameras, (a Canon 6D and a Sony a6000). Of course, I had my travel tripod and a small table-top tripod, too. Sometimes lugging a tripod around all day can get very tiresome, since I was only on foot or using public transportation. The table-top tripod was with me most of the time. 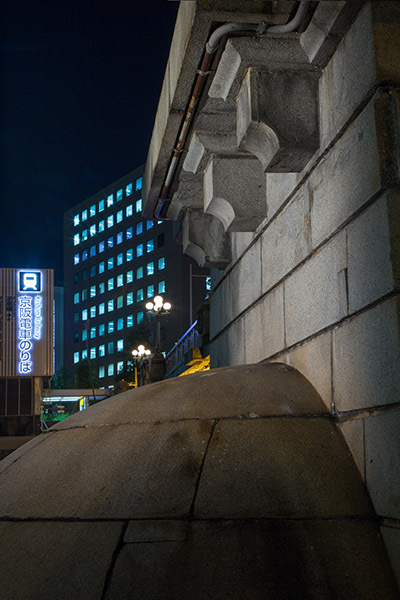 I dedicated one evening in Osaka to shoot in the city center and stumbled upon Nakanoshima Park which is on an island in the Okawa River. The shapes of this old bridge buttress caught my eye, with the modern city in the background. This highway came over the island park, across the river. It seems I can’t get enough of bridges lately! The blue light in the center is from a reflection of a blue LED light off of a pier. This majestic tree towers right up to the overhead highway. 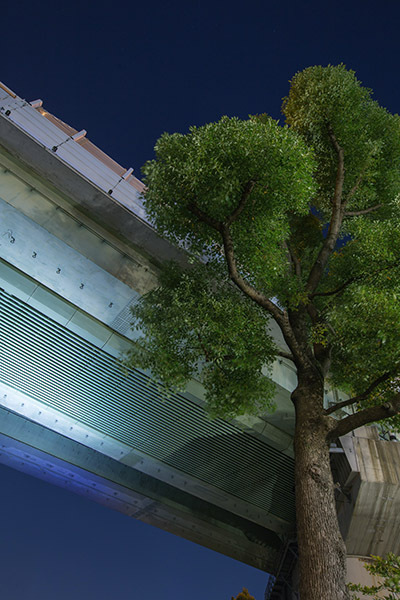 It seems like all the trees in Japan are trimmed regularly–not just in the many gardens but alongside highways. 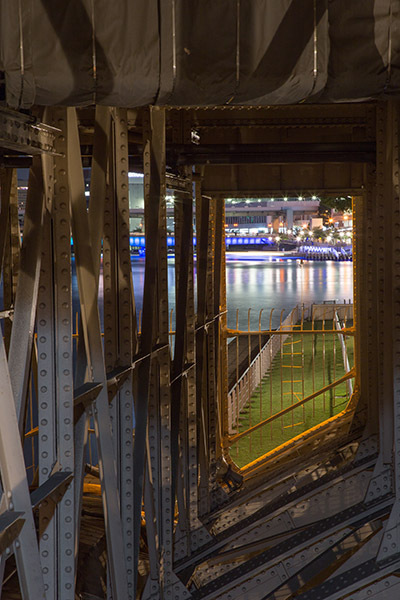 I took a stairway up to a bridge to leave the island and saw the interesting light within the steel structure of the bridge, with the city beyond. This is where I saw one of the few homeless people hiding in the shadows during my month in Japan. The mixed lighting on the stairway along with the shapes intrigued me. Simple, yet complex in design to find the right vantage point for the composition I wanted. No cropping here. We made a special trip to Itsukushima Island, more commonly know as Miyajima (“The Shrine Island”). 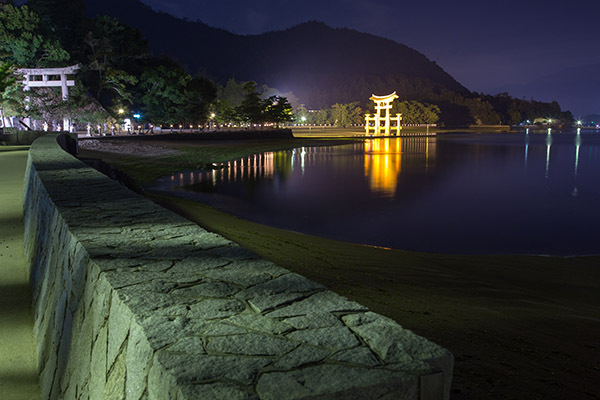 Most visitors make the day trip out of Hiroshima, but we stayed in a local ryokan inn to be able to see the famed torii gate in the water at night after the day-trippers have left. Even so, there were hundreds of people, both Japanese and foreign tourists who stayed and quietly watched the sunset. The current torii is from the 16th century, replacing the 12th century one. It was very mystical for all of us. I wandered the grounds for a couple of hours afterwards to photograph and there were very few people out. The little town of 2000 souls had all but shut down by 9pm. I felt I almost had the place to myself. Japan is a country of cameras and picture-takers. It’s a real passion for them and the the reason why most cameras come from Japan. It was nice never being hassled taking photos most anywhere–even with a tripod! The exception was in temples. 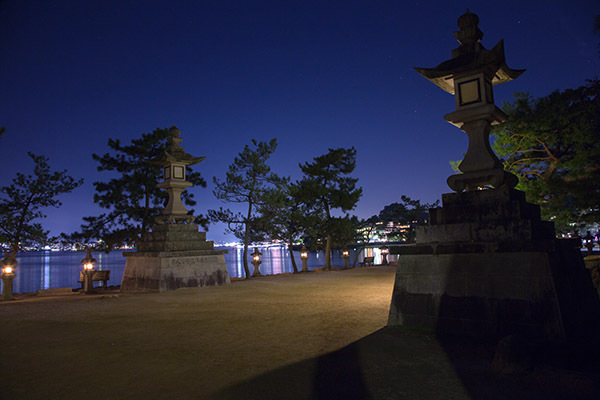 This view is typical of the paths around the many temples, pagodas and shrines on the island. A few people walked through (but didn’t show up) during this one minute exposure, but they didn’t even see me and my tripod in the shadows. 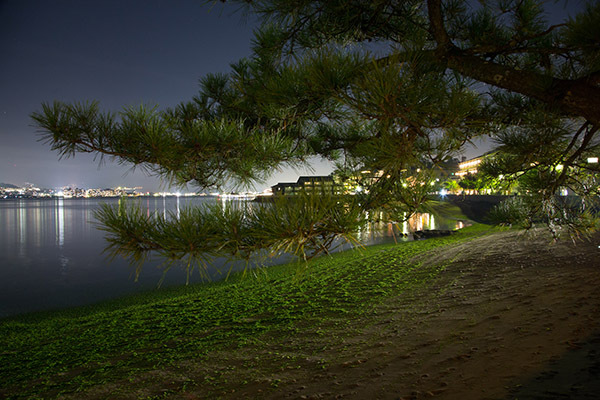 On the way back to the ryokan, I noticed that the tide had gone out revealing the algae on the rocky shore. The evening was windless and dead still for this one minute exposure. I positioned myself behind one of the pine trees (that seem manicured), blocking the lights, while back-lighting on the algae. 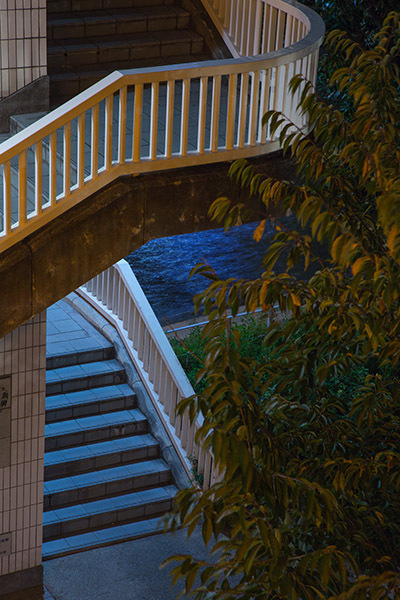 This is one of the images I made that really says “Japan” to me. There are many other views and locations that I might post in a future blog, based on the feedback. I’d love to hear from you. Many thanks for the comments. Would you like to see more in another post in a few weeks? Very cool! Wow, a month in Japan, sweet. Many thanks for the comments. Would you like to see more in another post in a few weeks? Let’s try to get together next month. Nice to hear about the acceptance of cameras and tripods. I traveled in the South many years ago. Sure, so us some more! Beautiful. Your signature of capturing the right light is what stands out the most. Enjoyed very much. I enjoyed these pictures (as always) Tom. I wish we had trees that were trimmed and manicured around here! Your pictures look so crisp and clean. I’m sure your time spent in Japan was very memorable. We had a Japanese exchange student in our home one summer when I was in high school, so I feel a special connection with Japan. Stunning and Educational. These are exquisite designs and exposures. what an opportunity that must have been! I’d love to see more, Tom! Nice work, always enjoy your work. Lovely seeing it – absolutely post more! The image the third from the top showing the juxtaposition of the modern highway bridge and majestic tree framed and shadowed light is wonderful. Also the third from the bottom showing the two torii gates in the background being lead to by the beautifully constructed stone wall is also quite beautiful! I would love to see more images from your Japan trip with some info on travel locations and logistics. Sounds like it was a spectacular trip! Japan is a photographer’s heaven. Everything, natural, human-assisted, or man-made is placed with the visual aesthetic considered from all POVs. I grew up there until I was 18. Thanks for the reminders of what I enjoyed. Very serene country…I’ve never been there. The Hiroshima pictures look so peaceful that it’s hard to visualize the destruction. Great compositions – can’t decide on a favorite – they’re all so fine. Great images, Tom! I love the bridge shots. I guess they decide to replace that Torii every 4-5 hundred years.. whether it needs it or not. I’m jealous that you were able to spend so much time there, and get to the parts of Japan that most of us never see. Lovely shots. They bring back memories of my time in Japan just post-war. You remain the poet of global isolation and structural detachment. All that that you see is desolation of sprit. Yet, your narrative gives hope. 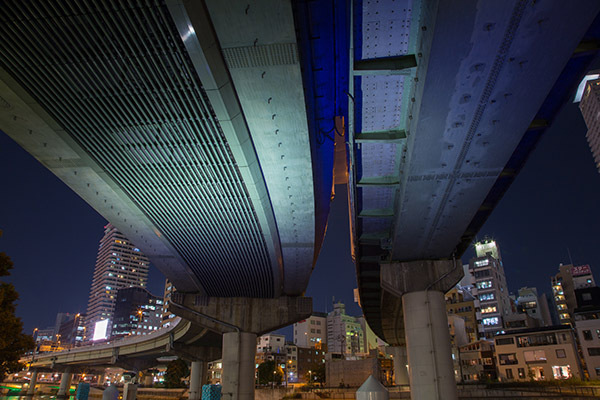 Nice shots, I will travel to Japan one day! Still think of the time you spent in my studio teaching me a few 4×5 tips! Wow. 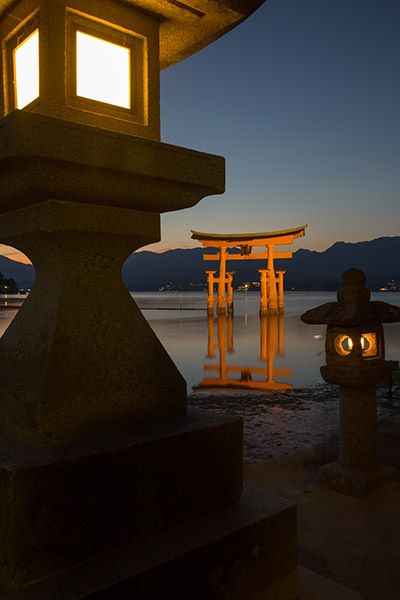 The Miyajima Torii at sunset with the lanterns, the golden hue of the Torii at night, the algae on the shore, the pine and the lights of the ryokan in the distance. Stunning. More please. Onegaishimasu!